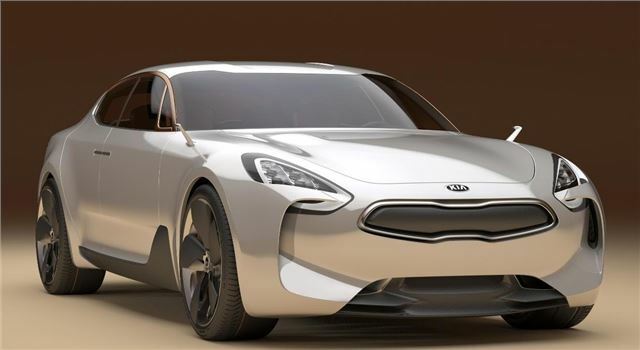 The distinctively styled Kia GT, which is similar in design to cars like the Porsche Panamera and Aston Martin Rapide, shows the new design direction for future Kia cars. The doors, which are rear hinged at the rear, open upwards as well as outwards, a bit like on an Aston Martin, and there’s a long bonnet with distinctive LED headlights, a raked windscreen and a short rear end with attractive tail lights. The cabin is driver-centric, and is spacious and airy despite the low stance of the car. The instruments are LED based, with readouts that can change depending on the drivers preferences. The controls are mounted on the steering wheel to reduce clutter on the centre console. The ‘mirrors’ – protruding from the wings like fins, are actually small cameras which relay their image to small monitors in the doors in the perfect, line-of-sight position. The upholstery is leather with a metallic surface treatment , making it smooth and giving a feeling of warmth. The front-engine rear-drive layout is typical of GT cars, although not common for the likes of Kia. Power comes from a 3.3-litre turbocharged petrol engine, which produces 534Nm of torque and 395PS, transferred to the wheels via an 8-speed automatic gearbox. For more Frankfurt news follow the page here.